The name Mara seems to come from a few different possible origins. 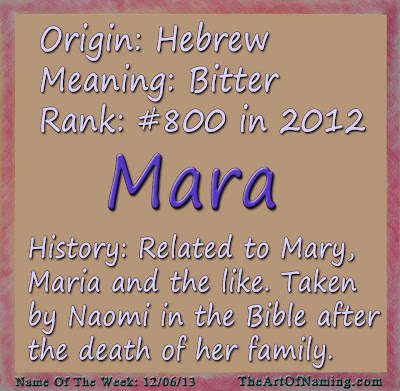 Firstly, Mara is a Hebrew name that means "bitter". It was taken by Naomi in the Old Testament at Ruth 1:20. Since it does mean "bitter" or "sorrow", she took it as an expression of her grief after her husband and sons died. As another possibility, Mara is the Hungarian variant of Maria and the Croatian and Serbian variant of Marija. 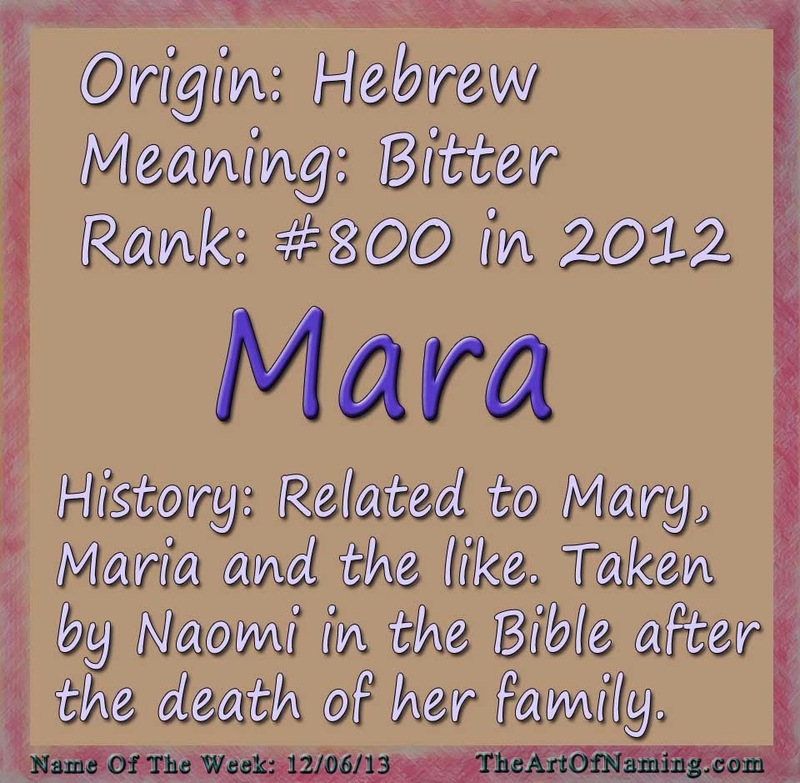 Of course Maria is the Latin form of the Greek Μαρια which comes from the Hebrew מִרְיָם or Mary. Marija also comes from Maria. The name Mary comes from the Hebrew name מִרְיָם or Miryam which does not have a known meaning. Theories include "sea of bitterness", "rebelliousness" and "wished for child." However! There is a possibility that Mary comes from an Egyptian name that is partly derived from mry which means "beloved," or mr which means "love". Whew! Sorry about all of that technical jargon. 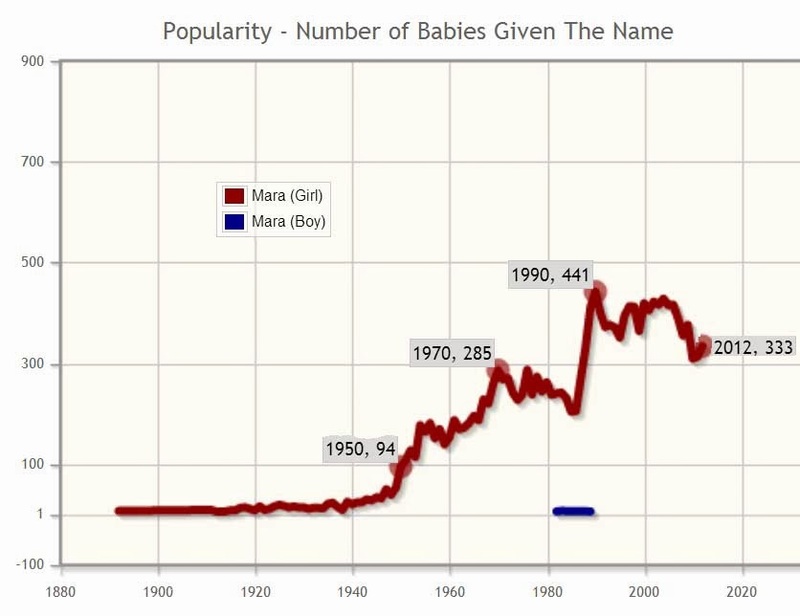 The point is, even though this name potentially means "bitter", Mary and Maria are notably two of the most-used feminine names in history. None of the parents over the years seemed to mind that it means "bitter" so I don't think parents today will care either. Mara is a beautiful name: she is short and sassy, sweet and bold. 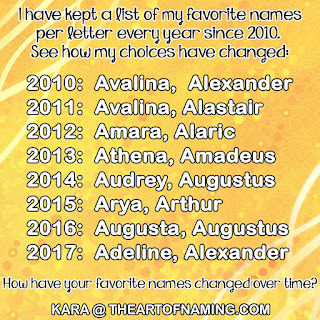 She's also related to a ton of other M names that come in various languages like Miriam, Mariska, Marilyn, Molly, Marielle, Mia, Moira, Maureen, and Marianne. As for popularity, Mara is sitting in the sweet spot between common and unusual. She ranks at #800 in the US. Mara first appeared in the US in 1892 when it was used for 6 baby girls. It was not on record again until 1911 when it gained regular usage. The birth count hit triple digits in 1951, peaking at 441 births in 1990 (#539). Mara has consistently been in the Top 1000 since 1950. Famous Maras include 3 actresses: Mara Wilson, Kate Mara and Rooney Mara. There is also a fashion designer named Mara Hoffman. On the mythological side, Mara (or Marzanna) is the Slavic goddess of winter, death and harvest. Mara is also a goddess in Latvian myths. What do you think of this name? Do you prefer a different variation of Mary? I don't think Mara is quite my style - I'd probably prefer Miriam, or even Amara.